The Turkish are very fond of percussion instruments. They have a unique variety of drums that are native to the country. The authentic Turkish drum goes by many names but is perhaps most widely known as the goblet drum. Shaped like a goblet this is a hand drum, which is commonly used in Arabic, Persian, Assyrian, Balkan, Azeri, Greek and Turkish music. It has a thin drum head, which is very responsive because of which it has a resonance that allows it to produce very distinctive and crisp tones. The exact time period during which the Turkish drum was developed is relatively unknown but it is considered to be a drum of ancient origins. In Turkey the goblet shaped drum is popular known as the Darbuka. The Darbuka has to be played in a peculiar manner that differentiates it from the other drums. The most striking difference in technique is the fact that it has to be played with a light touch and you need to make use of different strokes like rolls and quick rhythms using your fingertips. This is a very different technique as compared to the various African hand drums. There are two different kinds of goblet drums, which are the Egyptian style and the Turkish style. The Egyptian goblet drum has rounded edges at the head. On the other hand the edge of the head is exposed in the Turkish drum. It is because of this unique structure of Turkish drums that players can incorporate finger- snapping techniques while playing. However, it is not possible to play the kind of rapid rolls that are usually employed on Egyptian style goblet drums. The traditional style of playing the Turkish drum is to hold it under one arm, which has to be the weaker of the two arms. The alternate style is to place it sideways upon your thigh with the head of the drum facing towards the knee. This style is known as the lap style and is played sitting down. The larger Turkish drums come with strap mounts that allow the player to sling the drum over their shoulders and play while standing up. When played with light strokes using your fingertips and palm the drum produces a highly resonant yet low sustained sound. The tone of the drums can be altered by moving the fist in and out of the bell. There is a wide variety of traditional rhythms that are commonly played in folkloric Turkish music upon the goblet drum. The goblet drum produces two distinct sounds. 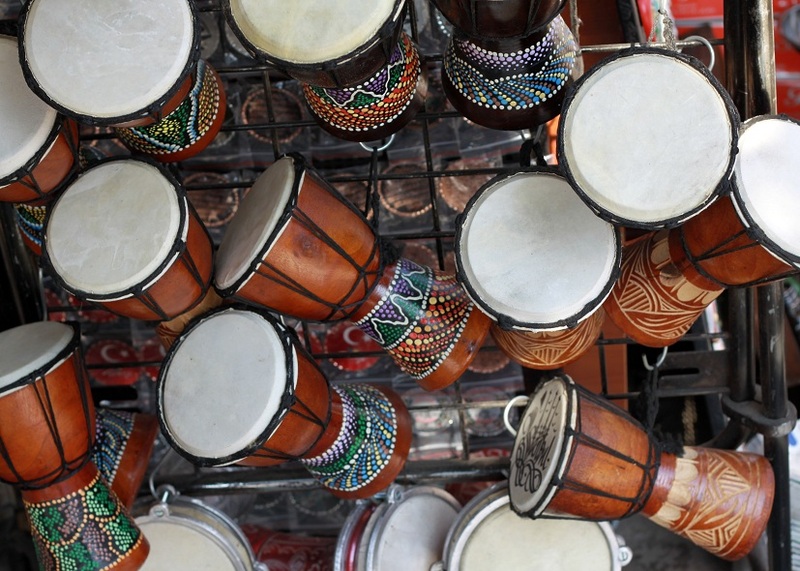 The deep bass sound that is produced by striking the drumhead close to the center by extending the fingers to their full length is known as the “doum”. The other sound is known as the “tek”. This is a high pitch sound that is achieved by striking the drumhead close to the edge. When played with the secondary hand, the same note is referred to as “ka”. Professional players make use of complex techniques that involve snapping, popping, slapping to create rolls.